The Intelligence and National Security Alliance is now accepting nominations for the 2017 Achievement Awards, which recognize up-and-coming leaders and mentors serving or supporting the U.S. national security mission. Joan A. Dempsey Mentorship Award – Public, private and academic elements up to and including GS-15/0-6 and equivalent rank. Sidney D. Drell Academic Award – Graduate students and untenured professors. Richard J. Kerr Government Award – Civilian government employees up to and including GS-13 and equivalent rank. William O. Studeman Military Award – Uniformed military personnel up to and including 0-3/E-6. Edwin H. Land Industry Award – Contractors and nongovernment employees with 8-10 years of nonexecutive experience. John W. Warner Homeland Security Award – Law enforcement personnel, intelligence analysts and first responders from the federal government and state, local, tribal and territorial partners. 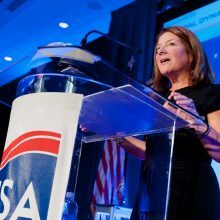 The INSA board of directors established the Achievement Awards in 2010 to recognize the accomplishments of entry- and mid-level professionals and mentors working in intelligence and national security. The six awards are each named after a recipient of the William Oliver Baker Award. Nominations are due by Oct. 31. Recipients will be acknowledged at the 2017 Achievement Awards reception. Both online and printable versions of the nomination form are available here. Instructions to submit nominees who would require a classified nomination are available by contacting INSA at achievement@insaonline.org.